Krazy Kat aficionados have long placed its creator, George Herriman at or near the center of the development of comics and cartooning. A prodigious talent, and true comics pioneer – possessed of an unquestionable genius – he produced comics of startling fluidity; words, images and design each blending seamlessly, each reinforcing and supporting the other to create works of lasting strength and beauty. The concept of the intelligent vocalizing cartoon animal – the “funny animal” – that gave rise to Felix the Cat, Mickey Mouse, Bugs Bunny, Donald and Daffy Ducks and countless others was more or less forged by Herriman, who in the process opened up a rich vein in the American psyche which is still being mined today. 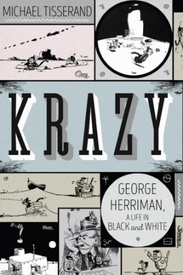 Here, in Krazy: George Herriman, a Life in Black and White, author Michael Tisserand broadens the context of Herriman’s life further, to encompass large swaths of American history, society and culture, and in the process places Herriman’s life not only at the center of the history of comics, but at the crossroads of America itself at the dawn of the 20th century. While it has long been known that Herriman was born in New Orleans of mixed “Creole” heritage, with African as well as European forebears, the specifics had always been murky, at best – but no more! Tisserand, much of whose earlier writing focused on New Orleans, and who evidently knows his way around a variety of New Orleans archives, leveraged his preexistent knowledge, rolled up his sleeves and dug deep, tracing Herriman’s roots back to the 18th century as well as outlining much of his extended family history. The story includes telling details of much of what transpired in post Civil War New Orleans in order to set the stage for Herriman pere’s decision to uproot the family, move to Los Angeles and “pass” (as white), at which point the book’s subtitle, “a life in black and white” becomes eminently clear. And that’s only the beginning! It’s always instructive to be reminded just how big a force comics were in their early days at the dawn of the 20th century. Before the movies really began to make their mark on the American scene, before radio, comics – appearing everyday in the majority of the country’s newspapers – were arguably the first mass entertainment, and as such made a tremendous, lasting impact in the popular imagination, and Herriman was there, almost from the very start. Herriman had been creating and drawing numerous illustrations, sports cartoons and comics strips for well over a decade before coming up with his most famous creation, having seen his first drawings published at the close of the 19th century. Krazy traces the highs and lows and ins and outs of Herriman’s extraordinary life, uncovering many heretofore undisseminated facts while also debunking some of the myths and legends that had sprung up to fill various lacunae in his life story. Not every mystery is solved, to be sure. Plenty remains for future Herriman researchers to strive to discover. And Tisserand may be among them, as he is reported to be paying attention to the responses he has been receiving to this work, perhaps for a future work, or revised edition. But don’t sit on your hands waiting for that day (that may or may not arrive). Krazy is an essential work of scholarship that will leave you with an increased understanding – and appreciation – of America , its culture and the central, formative role of comics in it all. ALSO: If you've read this far, we can all but guarantee that – if you haven't already – you'll want to read Chris Ware's incisive essay on George Herriman written on the occasion of the publication of Tisserand's biography, HERE. SPECIAL NOTE: All copies currently on sale are signed by the author, Michael Tisserend! 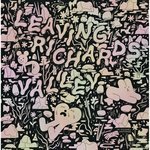 AND: Here's a link to Tisserand's appearance on WWNO's The Reading LIfe program.